PHILADELPHIA, PA — Elizabeth Fiedler is a working mom from a working class family. She’s running for State Representative for South Philadelphia, House District 184. Elizabeth has raised $52,724 as of December 31, 2017. As someone from a working class background, without connections to the establishment and the rich, these fundraising numbers are truly astounding. Even more astounding: that fundraising total comes from more than 400 individual contributions. 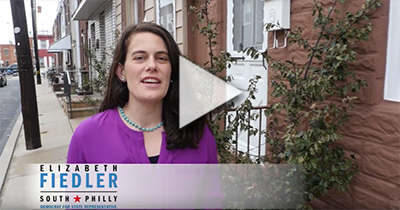 The financial investment, in addition to the more than 500 sign-ups to volunteer, are a clear indication of the immense breadth of support Elizabeth Fiedler’s campaign has built up. Her background as a reporter, personal story and dedication to the community are inspiring many people to get involved with a political campaign for the first time. This is a grassroots movement with a groundswell of support from working people — this is what politics should look like. We’ve invested this money in a massive grassroots field operation to ensure that every resident of the 184th House District has a voice in the way our community is governed. We’ve hosted more than fifteen meet-and-greets and town halls throughout the district. We hear the same things over and over again: politics as usual is not working for working people. Our neighbors are struggling: struggling to afford healthcare, struggling to ensure their children have access to high quality education, struggling to make sure there is food on the table and the lights stay on, struggling to find family sustaining jobs. Our campaign says enough is enough. We need a Pennsylvania that works for all of us. We DESERVE a Pennsylvania that prioritizes our communities’ needs. People are hungry for a vision of Pennsylvania that includes all of us, guarantees health care as a right and levels the playing field for working families. That’s why our campaign and our movement is growing so quickly. For more information about Elizabeth’s bold stances on education, healthcare, family sustaining jobs and justice visit our website.